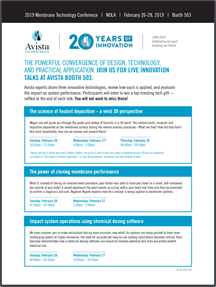 LIVE INNOVATION TALKS AT MTC19 AVISTA BOOTH 503 | Avista Technologies, Inc. THE POWERFUL CONVERGENCE OF DESIGN, TECHNOLOGY, AND PRACTICAL APPLICATION. At Membrane Technology Conference 2019 – February 26-28, 2019, New Orleans – Avista Technologies will showcase 20 years of innovation that has inspired and shaped the specialty chemical industry. Avista experts share three innovative technologies, review how each is applied, and evaluate the impact on system performance. Participants will enter to win a top-trending tech gift raffled at the end of each talk.